The GE Vivid e9 ultrasound is a top-of-the-line system designed specifically for 4D cardiovascular purposes. Although cardiovascular is the most used application for this ultrasound, the Vivid e9 also provides high-quality imaging and function for several other applications, such as abdominal, breast, musculoskeletal, and small parts. Regardless of the application, the GE Vivid e9 was specifically designed for 4D imaging with a variety of technologies, such as 4D tissue, color flow, Bi- and Tri-plane in both black/white and color, full volume scanning, stress, and strain. Furthermore, the GE Vivid e9 also includes Accelerated Volume Architecture, which helps to increase processing times as well as overall speed. The GE Vivid e9 features exceptional ergonomics and ease-of-use, helping the system adjust to many different types of exam rooms. A 4D cardiology ultrasound once seemed a bit of a gimmick, however, the technology has gained a lot of traction and it provides so many different views of the heart with a single capture. No longer does the tech have to find different windows to get an image, they can choose the best window and get all necessary views of the heart. 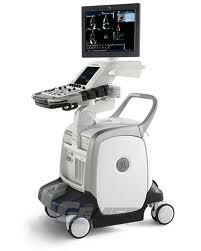 A used GE Vivid e9 should be a top consideration for those with the budget to buy this premium cardiac ultrasound.